As often happens when reading, one finds a source mentioned, follows it to something else, and off one goes. This was the case for me recently. 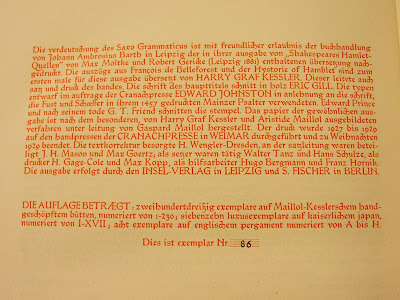 While researching a mention of Ernst Collin I came across an advertisement for a journal associated with a center-left political party among the names mentioned was an Ernst Collin, but also many other leading figures of the arts, civic organizations, politics, ... Also among the names was Harry Graf Kessler, an Anglo-German count, diplomat, writer, and patron of modern art who in 1903 became Director of the the "Museum für Kunst und Kunstgewerbe" (Arts and Crafts) in Weimar, founding the Deutsche Künstlerbund (German Federation of Artists - a very avant garde group) in the same year. Berlin in Lights, The Diaries of Count Harry Kessler (1918-1937) was reviewed in the New York Times in 2000 by Iain Bamforth, with the review entitled "Present at the Destruction" providing a good introduction to the man and the times. 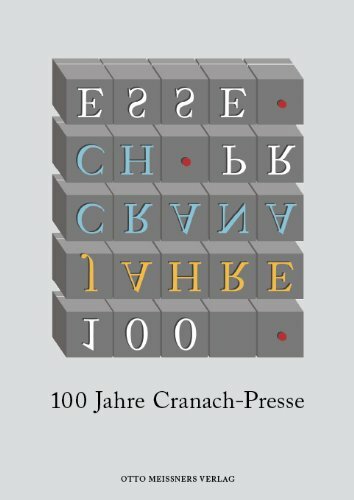 In 1913, Kessler founded the Cranach Press in the spirit of the Arts and Crafts movement and inspired by the likes of William Morris, the Doves Press, Cobden Sanderson, and others to publish livre d'artistes. Among those he worked with were Eric Gill, Henry van der Velde, Aristide Maillol and Edward Gordon Craig . 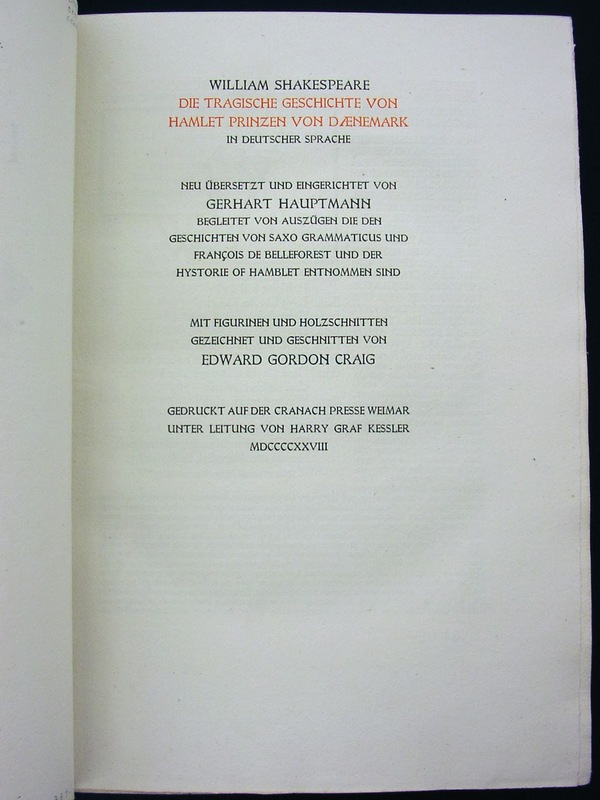 It was the latter who illustrated the Cranach Press' Hamlet in 1928. Sarah Werner in her Wynken de Worde blog has a good illustrated description of the Hamlet. 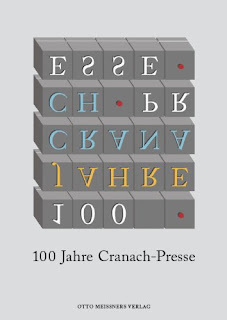 The Herzogin Anna Amalia Bibliothek in Weimar is celebrating the 100th anniversary of the Press and issued a wonderful catalog that provides background information on Kessler, his activities in Weimar, with the remainder given over to the depicting works Kessler published, including job work. The bulk of the illustrations are dedicated to the livre d'artiste however. 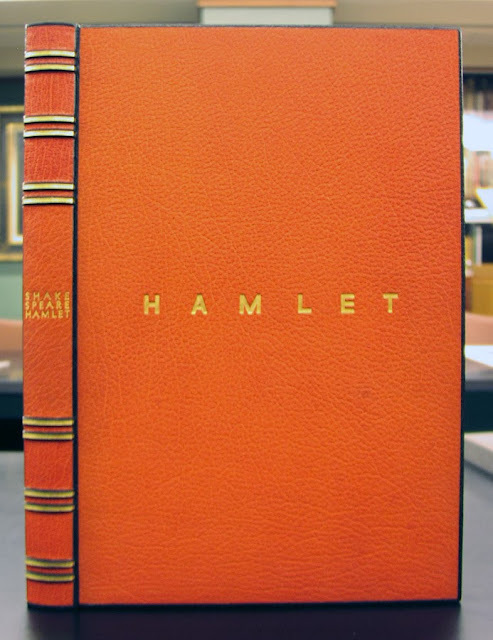 Also included in the catalog is a poster depicting the process of creating Hamlet, including layout, preparing the paper, proofing, printing and not enough of the binding process by Otto Dorfner (below). 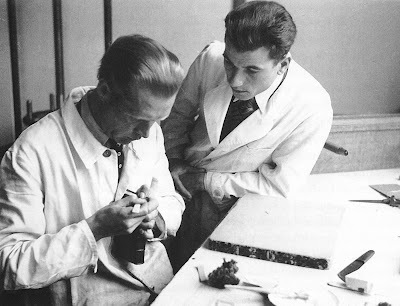 Dorfner was also associated with the Bauhaus in Weimar, was a founding member of Meister der Einbandkunst, but also was on the Nazi's Gottbegnadeten List or artists crucial to the Nazi's culture. He created among other things presentation bindings and objects). 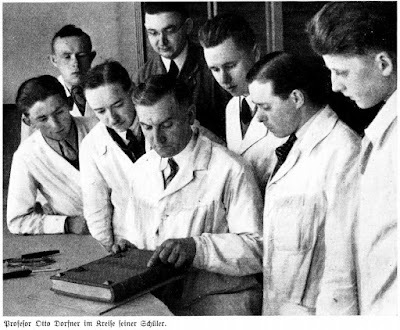 "Professor Otto Dorfner surrounded by his students"
Note the master in his white lab coat (kittel) surrounded by his focused students critiquing work. 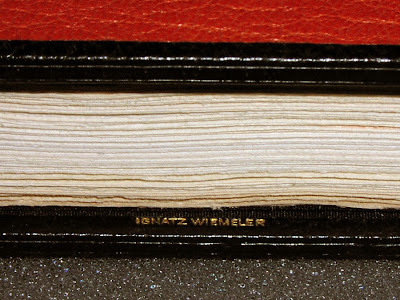 From: Weisse, Franz. "Prof Otto Dorfner 25 Jahre Fachlehrer." The catalog to the exhibit can be ordered online from Amazon. It's in German only, but has lots of pictures. Is this really a prospectus for the Cranach Press' edition of *Hamlet*, or a (later) facsimile of one? It's printed on a beautiful cream laid sheet, no watermark. 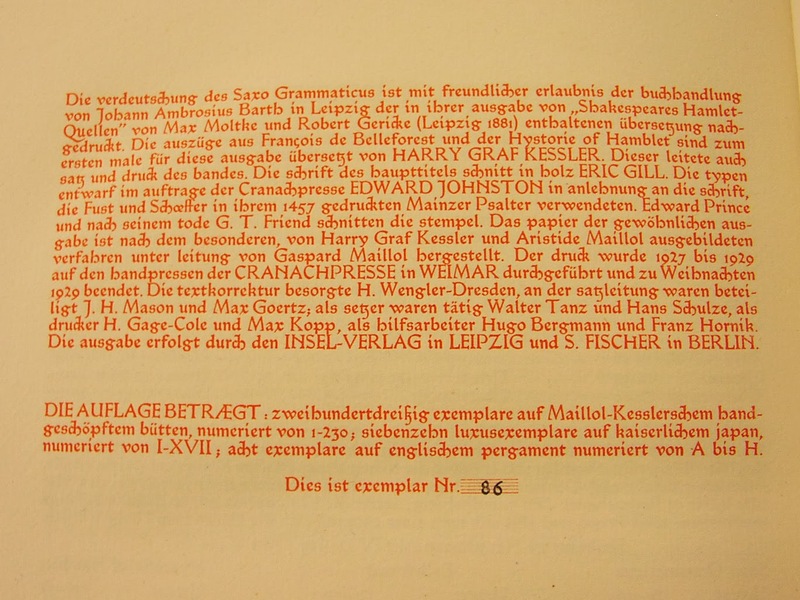 The last page appears, to my high school German, to be a description of the different states in the edition ("eight copies on vellum/parchment...") with prices in Marks. 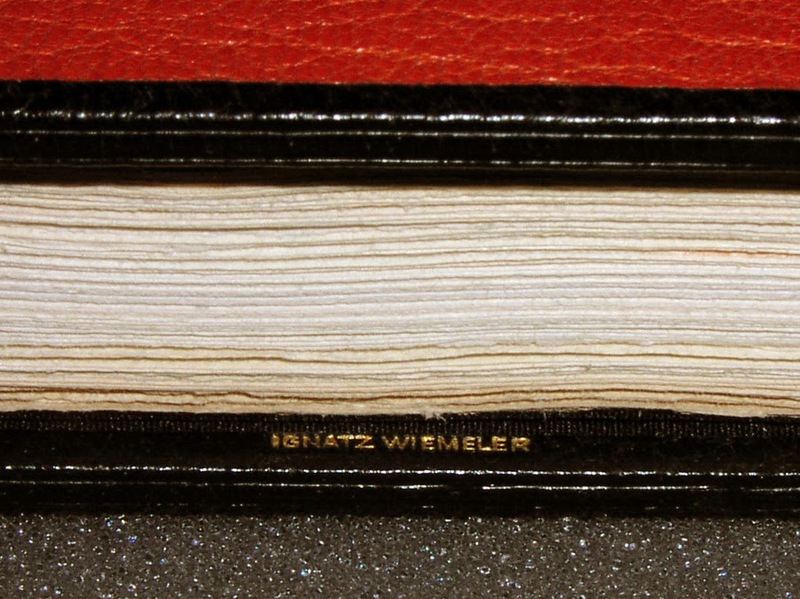 A small addendum at the bottom of that last page tells us the piece is a "keepsake supplied by Gallery 303 to the participants of the Heritage Series."